Ride a bike through bombed-out military bases in post-Soviet Russia. Free full version racing game! No banners, no ads, no in-app purchases! Guide your buxom blonde bombshell through bombed out Bolshevik military bases in post-soviet Russia in this free game. 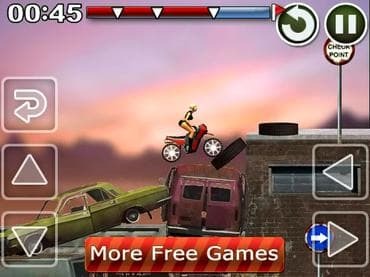 As an independent and capitalist minded blonde beauty in the ruins of the Soviet Union's collapse, you must take your finely tuned motor bike skills and put them to the test against all of the perils of your homeland. The only thing that is more dangerous than your Russian beauties' curves are the perils of this Russian wasteland that are unwilling to let her leave. Streamlined graphics, side scrolling motocross action and simple controls make this quick-to-learn and fun-to-play bike game a winner deserving of the finest Russian royalties praise. Don't let this wonderful Russian biker wallow away in Russia. Help her to become a fine American import, and bring her beauty and bike to America! If you have questions about Soviet Bike game, please contact us using this form.